We went to the Flume Gorge at Franconia State Park with the family on the first full day of vacation. I haven't been to the Flume for over 25 years but I had remembered enjoying it. Surprisingly enough Katie didn't put up a fight and seemed fairly excited about going. She wanted to be the tour guide on the hike. By the way - a great thing to know about NH state parks is that NH senior citizens get in for free. You need a picture ID but if you are 65 years or older and live in NH then you get into all state parks for free. Not only do you get into the Flume but you get a free ride on the tramway if you desire. The hike was a lot of fun and I got some great pictures. Katie enjoyed going up the flume although I am not sure that being a tour guide is really her thing. For the first half mile she never looked up from the map and the guide except to see if we got to a place yet. It was cute and endearing but she missed a lot. The second issue for her was that the tour guide always has to be in front. You weren't allowed to pass her which always makes things interesting. 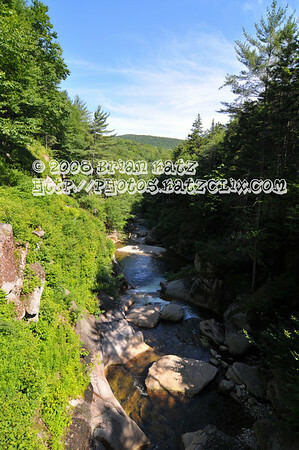 The Flume still holds its beauty and it is a fun hike - it does help to be in some shape. The girls especially liked when I came up through the Bear Hole. Kimmy was sure that I couldn't make it but I won't take no for an answer and got up fairly easily. We took the Ridge trail back and that leads you by the Pool. I took this shot from the covered bridge looking into the pool.